A great mid-sized ride on floor scrubber, the Tornado BD 26/27 unit offers an automatic mode where you can start all operations of the scrubber once it is turned on. This will gradually start all of the motors for a more gentle power draw from the batteries; overall this is easier on the batteries and motors. When in reverse, this rider scrubbing machine also includes an automatically retractable squeegee. Clean hard floor surfaces in large, open spaces faster than ever with Tornado's ride-on automatic floor scrubbers. Increase your cleaning productivity in areas including airports, supermarkets, manufacturing plants, exhibit halls and much more. This BD 26/27 model has twin rotary scrubber brushes (not included). It does come standard with pad holders if you're cleaning preference is to use scrubbing pads instead of brushes. When used with the appropriate pad, this is the ideal solution to daily maintenance cleaning. Call for special pricing if you'd like the eco-friendly battery pack - a great option for your environmentally conscious building cleaning services. 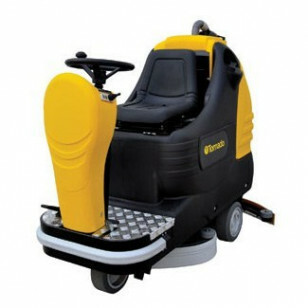 If you're looking with a machine with a larger scrubbing width, we also have many other ride on floor scrubbers to choose from, including a popular 30 inch riding floor scrubber machine and a 32 inch rider floor scrubber. 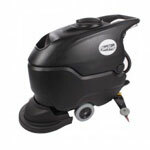 You're sure to find just the right machine for your floor scrubbing job with us!